Buratti, Andrea 2019. Western Constitutionalism. p. 145. Caney, Simon 2018. Justice and Future Generations. Annual Review of Political Science, Vol. 21, Issue. 1, p. 475. Troccoli Carvalho de Negreiros, Gustavo 2018. Law and Opera. p. 377. Loland, Sigmund 2018. Morgan, the ‘Gratuitous’ Logic of Sport, and the Art of Self-Imposed Constraints. Sport, Ethics and Philosophy, Vol. 12, Issue. 4, p. 348. De Vincenzi, Roberto 2018. Verso una maggior integrazione tra politiche attive e politiche passive del lavoro. problemi attuativi. ECONOMIA E SOCIETÀ REGIONALE, p. 64. YI, Huiyuhl 2018. CONSTITUTIVE AND DEPICTIVE CREATIVITIES IN PHILOSOPHY AND CRITICAL THINKING. Creativity Studies, Vol. 11, Issue. 1, p. 24. Hafenbrädl, Sebastian and Woike, Jan K. 2018. Competitive escalation and interventions. Journal of Behavioral Decision Making, Vol. 31, Issue. 5, p. 695. Roznai, Yaniv 2018. An Unamendable Constitution?. Vol. 68, Issue. , p. 29. Street, John Negus, Keith and Behr, Adam 2018. Copy Rights: The Politics of Copying and Creativity. Political Studies, Vol. 66, Issue. 1, p. 63. Brogdon, Matthew S 2018. The Formation of Judicial Federalism in the United States. Publius: The Journal of Federalism, Vol. 48, Issue. 2, p. 269. Lenz, Hartmut 2018. Achieving Effective International Cooperation: How Institutional Formalization Shapes Intergovernmental Negotiations. World Affairs, Vol. 181, Issue. 2, p. 161. Michel, Stephan and Cofone, Ignacio N. 2018. An Unamendable Constitution?. Vol. 68, Issue. , p. 123. Ortmann, Günther and Sydow, Jörg 2018. Dancing in chains: Creative practices in/of organizations. Organization Studies, Vol. 39, Issue. 7, p. 899. 2018. Legal Foundations of EU Economic Governance</I>. p. 18. Ortmann, Günther and Sydow, Jörg 2018. How Organizations Manage the Future. p. 67. Galeotti, Anna Elisabetta 2018. Political Self-Deception. Birch, Sarah 2018. Democratic Norms, Empirical Realities and Approaches to Improving Voter Turnout. Res Publica, Vol. 24, Issue. 1, p. 9. Karlsen, Joakim and Løvlie, Anders Sundnes 2017. ‘You can dance your prototype if you like’: independent filmmakers adapting the hackathon. Digital Creativity, Vol. 28, Issue. 3, p. 224. Malkopoulou, Anthoula 2017. Ostracism and democratic self-defense in Athens. Constellations, Vol. 24, Issue. 4, p. 623. Common sense suggests that it is always preferable to have more options than fewer, and better to have more knowledge than less. This provocative book argues that, very often, common sense fails. Sometimes it is simply the case that less is more; people may benefit from being constrained in their options or from being ignorant. 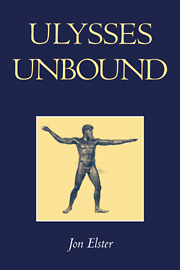 The three long essays that constitute this book revise and expand the ideas developed in Jon Elster's classic study Ulysses and the Sirens. It is not simply a new edition of the earlier book, though; many of the issues merely touched on before are explored here in much more detail. Elster shows how seemingly disparate examples which limit freedom of action reveal similar patterns, so much so that he proposes a new field of study: constraint theory. The book is written in Elster's characteristically vivid style and will interest professionals and students in philosophy, political science, psychology, and economics.